Motors are a vital part of every conveyor. They’re what drives the belt so products get from point A to point B. Traditional motors are great if you’re just moving product down the line and aren’t concerned with product spacing, indexing, or accurate product placement. So what should manufacturers do when their applications call for precise movement? The answer is to use a Servo driven conveyor. A Servo motor comprises of a power source, motor controller which stores the commands for the motor, a signal amplifier which amplifies the motion signal to the higher levels needed by the motor, the motor which is typically a brushless DC motor, and a feedback device to send the signal back to the controller about the motor position/speed. To ensure accuracy, when the motor moves the encoder sends information to the controller which looks at the data and compares it to the desired data. If it doesn’t match the controller changes the signal to the motor. This happens constantly to ensure that the motor is working the same each time. Regular industrial conveyors are driven solely by friction. The drive pulley and the product sitting on the belt are held in place by friction. Because of this, these conveyors aren’t very accurate when it comes to indexing or product positioning. When the conveyor is moving there can be small amounts of belt or product slippage causing inconsistencies which limit its ability to index or space products accurately. Dorner Precision Move conveyors offer much more controlled movement which allows it to be applied in applications where traditional conveyors fall short. Most of the applications are used in situations that require precise belt movement so the product moves evenly or spreads out. Precision Move conveyors work great in common drive applications where the two belts have to move at the same speed so that the products don’t shift and skew. This is great for products that are too large to fit on a traditional conveyor, inspection, and assembly automation. They also work great with slave driven conveyors which are driven end to end versus side to side. Connecting each conveyor to one motor saves money and eliminates the need for extra drive components. When using a slave drive configuration the Servo motor used in conjunction with photo eyes allows the conveyor to sense where the product is and slow down or speed up each conveyor to evenly space products. 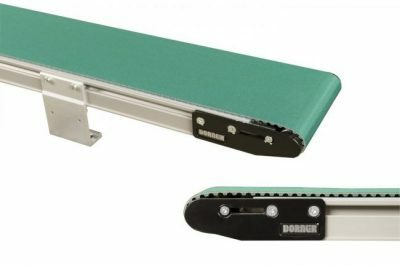 Dorner Smart Pace conveyor takes product spacing a step further and uses a photo eye which communicates with the Servo motor to automatically vary the conveyor speed and moving conveyor junction which evenly spaces products to the manufacturer’s requirements. Using Servo motors in conveyor applications opens up a whole world of possibilities for manufacturing applications. They allow for precise movements which are great for where common or slave driven conveyors are needed. Dorner Precision move conveyors can be used in applications where products need to be moved to the same place each time or need to be evenly spaced. With precise movement and accurate placement, Servo motors make applications that would be challenging for traditional conveyors easy. Is there any catalogue available for the standard conveyors you have. I am working in a project feasibility, I may look at your conveyor options to see if it can fit with in.